Pack of (5) – 4.5 Cu. 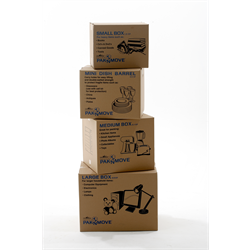 Ft. Large Pak-N-Move Cartons are a great choice for shipping or storing household items such as lamp shades, stereo speakers, comforters, blankets, clothes, stuffed animals pillows, or any large yet lighter items. These boxes are big, so remember to minimize the weight for easier lifting. 4.5 Cubic Foot, Size: 18x24x18h, 32 ECT.